Katusha team launch reveals new Bond villain. The evil Ivanov. I will strangle Bond with a bicycle chain. Block-buster news from the 2010 Katusha team presentation in Desenzano del Garda, Italy. The team of Italian National Champion and Paris-Roubaix runner-up Filippo Pozzato was presented along with Australian sprinter Robbie McEwen. Pretty exciting stuff but nothing compared to the announcement from Katusha’s Russian rider Sergei Ivanov. Last year’s winner of the Amstel Gold race and a stage of the Tour de France said he’s signed on to play the villain in the next James Bond movie. 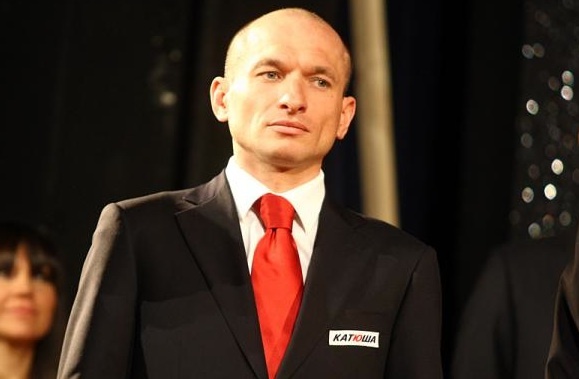 The classy but bald headed and evil-looking Ivanov said he’s looking forward to going head to head with the famous English secret agent. “I beat Kroon at Amstel, Bond will be no different.” said the Russian. « Tom Zirbel’s B sample positive for DHEA. A + B = bad news.